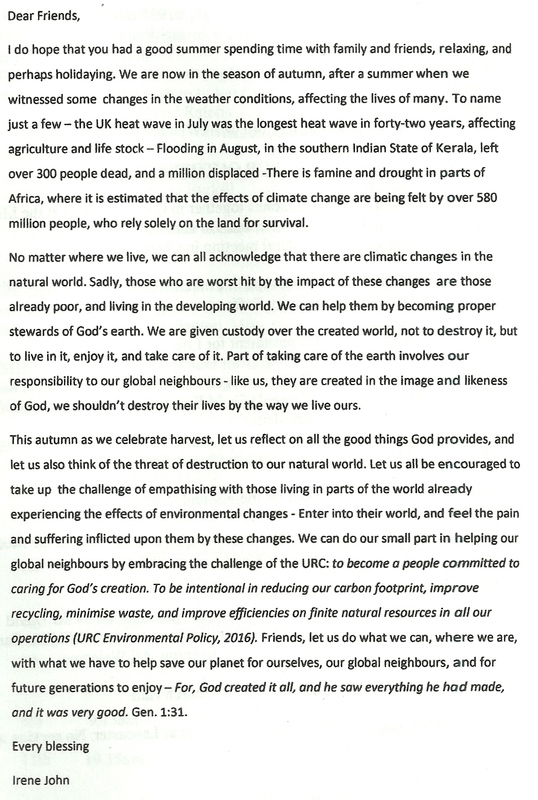 Below is the latest Pastoral Letter. 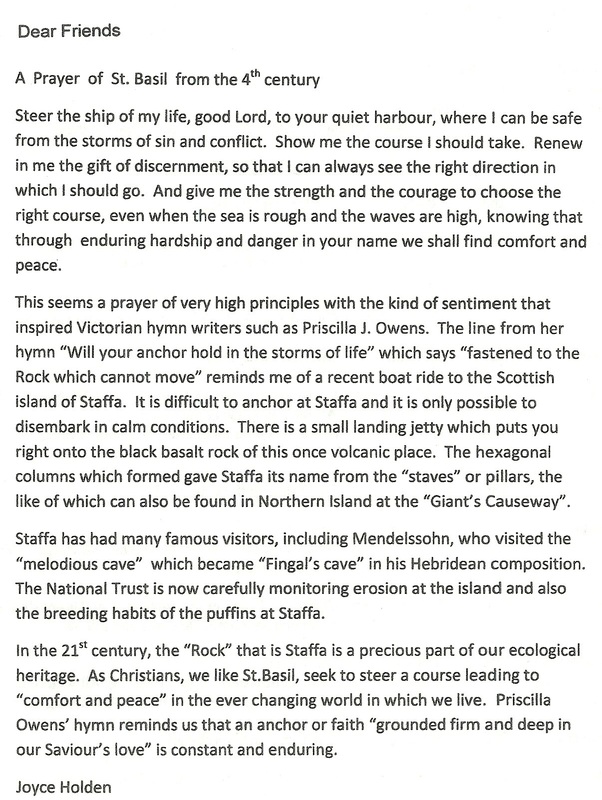 Previous letters can be found at the end of this Pastoral Letter. Irene has asked me to introduce myself and my new role to you as I am now working as the convenor of the Steering Group for the 7 churches in the North Lancashire Missional Partnership. I hope that in serving you in this capacity, I will be doing God’s will and together we will be working for the growth of God’s Kingdom. Some of you will have met me, but let me give you a few personal details: I was Minister of Carver URC in Windermere for 11 years until I was asked to be the Moderator of Northern Synod for short time and I served there for 3 years. When I retired in 2016 I moved back to Windermere where my family has lived for the past 35 years. I am married to John and we have 2 sons and 2 granddaughters. The role of the Steering Group (each church has nominated a representative) is to ensure that although we are 7 different churches in the North Lancs. Missional Partnership, we will work together with 2 Ministers and Daleen ten Cate (your Missional Discipleship Mentor) to show our local communities that we live out the faith that we profess. We will aim to learn from one another, support each other in our mission activities and assist those who have difficulties or special needs. This, of course, depends on us getting to know one another and developing new relationships. The first task of the Steering Group is to consider what the N. L. M. P. needs in a second Minister: gifts and graces that will complement those of Irene and how you and they might work together for God’s Kingdom. The FLAG pastorate churches (Forton, Lancaster, and Garstang) have been sharing a Minister and some events for some time. The churches in Halton, Bolton-le-Sands and Hest Bank have similarly shared a Minister (who has now retired) and Sefton Road in Morecambe shared with another church which has now closed and their Minister has also retired. They will be replaced by 1 Minister who, like Irene, will serve the whole partnership. For all of you, it will be quite different to share 2 ministers between you and to be part of a bigger group of churches. This will involve some different thinking, fresh organisation and new ways of working for you and your Ministers. The Steering Group will be organising some activities so that we can begin to get to know each other and start this new journey together as a Partnership and to this end we are hoping as many of you as possible from all the churches will come together on Saturday June 15th at Trinity Lancaster from 10.30-3.30 with a Jacob’s Join lunch. I have already led worship at Trinity Lancaster and in Garstang, and have a further date for Lancaster. I would love to be invited to lead worship in the other churches of the partnership, so please don’t hesitate to contact me to lead worship in your churches. I am looking forward to working with you all and discerning the right path that lies ahead to the glory of God. Pastoral Letter for December and January. Maranatha! Come, Lord Jesus, are words repeated countless number of times, in this season of Advent, leading on to Christmas. The key features of advent are the watching and waiting; the expectant longing for the fulfilment of the promise made by God, that the Messiah would come to lighten the darkness of those living in the shadow of death (Isaiah 9:2). Jesus Christ, came on the first Christmas to fulfil this promise, and he will come again as ruler of the world. So, we celebrate Christmas even as we continue to wait with expectation, and anticipation for his return. Our expectant waiting is heightened by the sense of hopelessness and despair covering our world today. Someone describes it as: light going out of life, and the feeling of sinking into a dark and bottomless pit, with the need to be rescued. Today, we hear the deafening cry for help and rescue from: the family who fled their homeland for somewhere deemed to be safe, only to be brutalised and dehumanised, we hear it from the young man who has lost the will to live, and from the lonely elderly couple who have no family, and no longer know anyone, in the neighbourhood they have lived for over sixty years. We hear the cry from a parent waiting for justice for an only child that was murdered, we hear it from the child born and raised in a war zone, and from the farmer and his family who suffer because of environmental changes, and unfair trade patterns, and the list goes on. Friends, we all long for a better world where suffering, unfairness, inequality and injustice are ended. We wait expectantly for the day when good will finally triumph over evil, and love over hatred. But we must acknowledge that even though the world is a place of hopelessness and despair, it is also one of hope and promise, for at advent and Christmas we are reminded that God sent Jesus Christ, his only son to bring us light and hope in the midst of darkness. So, don’t give up hope – if you lose hope, somehow you lose vitality that keeps life moving, you lose courage to be, that quality that helps you go on in spite of it all – Martin Luther King Jr. Christ will come again in the final advent when God’s kingdom will be established on earth. Until then, let’s overflow with joy, hope and inner peace, and be a part of the faithful who share hope and light to others in the world. Wishing you a happy Christmas, and a good New Year. 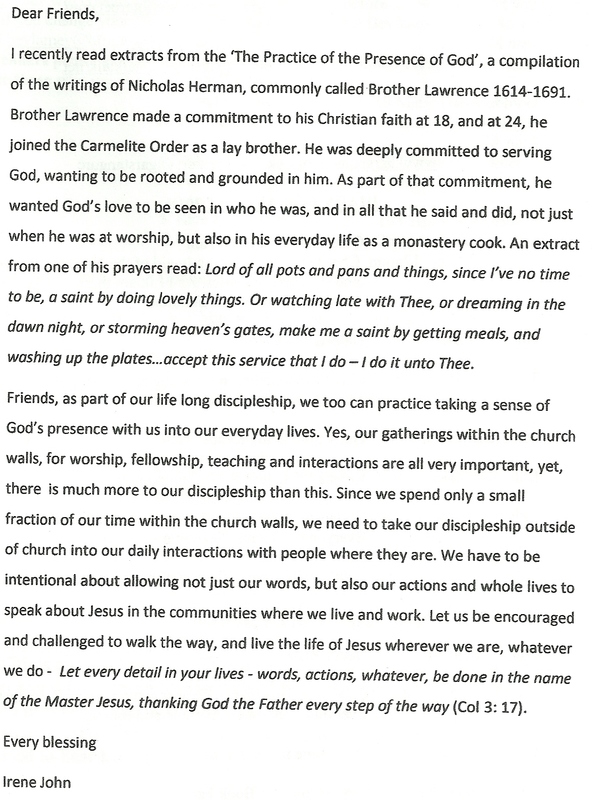 Pastoral Letter for October and November. Pastoral Letter for June & July. Friends, summer is a time to see the greatness of God reflected in the beauty of nature that surrounds us. So please try to find time each day to stop your activity, to enjoy and praise God for who he is, and what he has done, and continues to do. Look with fresh eyes and appreciate God’s creativity – his attention to details, the freshness of the morning mist, the moon and stars at night, the rich variety of colours and textures of the landscape, the miracle of growth, and much more. Whether at work, or recreation, enjoy the feeling of being alive, and the freedom to worship - find God in what you do, and see, and listen to, and be at one with him – for He has made all things beautiful in its time, Ecclesiastes 3:11. 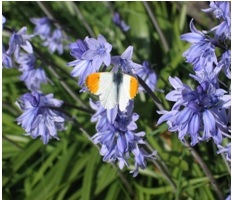 Enjoy this photo of bluebells and an Orange tip male butterfly from Alison Hale’s garden. Walking has always been one of the great loves of my life. So when I saw the new U.R.C. material called Walking the Way, I Googled it and found lovely images of beautiful roads, pathways and tracks. Walking the Way reminds us that we walk in the footsteps of Jesus. Jesus walked everywhere teaching, preaching and healing. The parables tell stories of a man walking from Jerusalem to Jericho, the shepherd who lost his sheep, the sower sowing his seed, the workers in the vineyard. They show Jesus observing the world around him and showing the deeper significance of the ordinary things in God’s creation. Several years ago Sally asked us all to compile a page of photos and images of our favourite Bible texts for a book she was making. It is still in the church porch. It was a lovely idea, and those of us who created a page got a lot out of it. I chose the text “I am the way,” and put in photos of our family and friends walking along tracks and paths – some were smooth and easy , some were more uphill and difficult. One of the walks I remember vividly was when our children were small. There was a ten year old, a seven year old and a four year old, and we were walking in the lakes. We found ourselves higher than we meant to be, and the mist came down. It was all very scary! We prayed, and somehow found our way down a very steep track, David carrying little Emily on his back. I sometimes think about that experience. One moment we all seemed to be happily enjoying our walk, knowing where we were going and looking forward to our evening meal. Then suddenly the scene changed, and for a few worrying minutes we thought we were lost. Then all was well. How often does that happen in life? We think all the good things we have, like health and strength, will be there forever . We think that our church life will remain the same, but then quite suddenly that can change too. We think we are happy as we are - then something new happens, and God calls us out of our comfort zones to move in a new direction. This is what we are all being asked to do on Sunday 20 May. We have a special service for Pentecost to embrace our new Mission Partnership – in which the eight churches of North Lancashire will join in partnership and mission. It will be a new path, a new direction and a new challenge for all our churches. But we are not alone! As we prayerfully enter this new stage in our church life, Jesus has promised to walk with us – to hold our hand whenever we need Him - for He is the Way.